The INFINITI QX80 Towing Capacity hasn't changed in quite a few years. Unlike companies like Ford, RAM and Chevrolet whose seem to be in towing capacity competition year after year, INFINITI is happy with their towing specifications. All models come equip with a 400-hp 5.6-liter V8 gas engine. 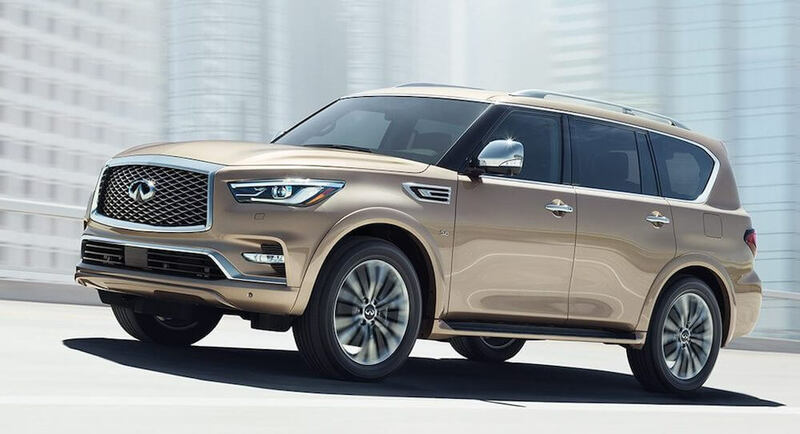 Regardless of the QX80 model chosen, the towing capacity for 2019 lineup is (8,500 lbs). The QX80 can tow 8,500 pounds in either the rear-wheel-drive (QX80 LUXE) or the 4-wheel-drive configuration (QX80 LUXE 4WD or (QX80 Limited 4WD). The QX80 matches Yukon's max capacity and beats out the Mercedes by 1000 pounds. How much can a QX80 tow? Which INFINITI Models can tow 5000 lbs or more? For more information on INFINITI Towing, please refer to our 2019 INFINITI Towing Guide.